In a day of radically changing – and sometimes confusing – cuisines, two young Czechs are busy defining their own radical culinary vision. Adam Ruman and Radek David are throwing down the gauntlet to local diners. These two slightly built, pleasant young men are dead-set on boldly challenging perceptions of cuisine, ready or not, with their own brand of food-as-art. Dubbed “Fusion light”, it’s a sort of post-cuisine cuisine, piled in smallish portions and containing seemingly disparate Eastern and Western elements, including anything and everything from shiitake mushrooms to rucola, goat cheese and sashimi. 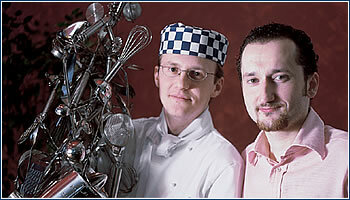 Chef Radek David is the brains behind this strategic assault. Formerly with the restaurant at the Radisson SAS Alcron Hotel, David has been cut loose at La Veranda, freed to explore uncharted (locally, anyway) avenues and byways of the palate. “When you do fusion,” says David, “there are no limits. Here, I’m free to play with the food.” He and Ruman travel extensively on eating trips, closely observing and imitating some of the trendiest of trendy global eateries. “We have four cities we’re trying to bring to Prague,” says Ruman, “London, New York, Tokyo and Singapore, which we feel are the meccas of new cuisine.” Ruman and David recently returned from London, where they had a chance to observe such bastions of avant-garde as Spoon+, Nobu, and Empire. “We’re trying to help people without the time to travel become comfortable with the ideas and materials used in kitchens world-wide,” says Ruman. The “see and be seen” factor at La Veranda is currently quite high, with most tables at the weekend filled with local personalities and familiar faces. Roughly two thirds of the clientele are made up of expats, though Ruman says he’d like to make a more concerted effort to reach the local population. This, as he acknowledges, will not be easy. When he describes the delights of dishes like ant rice, crocodile, zebra, and cobra, one can almost see the chorus of cringing Czechs that would greet the arrival of similarly adventurous concoctions in Prague. It should be noted that La Veranda has not breached this level of experimentation, that of insect and reptile appetizers, just yet. 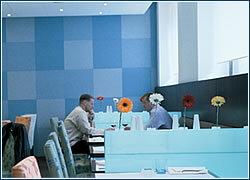 Dishes at La Veranda are angular and stark, stylized with dabs of rainbow-colored sauces. The visual presentation features immaculate lines and vivid color contrasts, and extends beyond the food to spill off the plate and onto the walls as well. A personalized design by Jakub Turek has endowed La Veranda’s interior with an imposing wall of geometric blue panels, candy-colored chairs and a defiantly spartan, white background. The juxtaposition of synthetic coloring and harsh angles creates a feel similar to watching Japanese Manga animation. A constant thread – light on fats and heavy on vegetables – runs through nearly all items on the La Veranda menu. “West and East” salmon is prepared with lemon-ginger sauce, and oyster and shiitake mushrooms, while a penne pasta dish contains stewed artichokes, coriander-lime pesto and cherry tomatoes. Nigiri (raw cuts) and maki (rolls) sushi are available, as are a blackwheat noodle salad and a spicy Thai chicken soup. Ruman and David should be applauded for challenging staid notions of cuisine, importing styles deemed cutting edge even in New York or London. Their efforts may not be appreciated by everyone, but the sort of clientele now gathering regularly at La Veranda seems to have no problem approaching cuisine with an open mind. The Mexican restaurant Todos Los Días (All These Days) is right downtown, but hidden in the side of the austere, tall building of the Nisa coffee shop. If you go downstairs to the basement, all trace of this austerity vanish. The ceiling is covered with burlap bags, and nearly every chair is of a different color and shape. 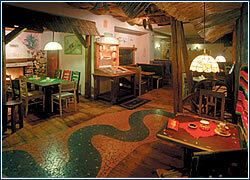 The restaurant has various nooks – by the fireplace, by the salt-water aquarium, or on the wooden stage (special places that must be reserved in advance). The menu offers not only Mexican food, but also Spanish (paella), American (ribs), and, surprisingly, Italian as well (spaghetti) – and pays special attention to seafood and steaks. The staff is professional and can provide informed advice on your selection. One advance tip: skewers, with either meat or shrimp. As for beverages, try some of the Latin American wines, or in the winter, classic mulled wine. It’s served here with whole cinnamon sticks, in tall, thin glasses so that it will not cool too quickly. A meal for two costs about CZK 800. ANYONE WITH a hankering for true Lebanese cuisine will find culinary salvation in a somewhat unlikely place. In the passage that abuts the Kotva complex, an oasis of flavor has recently sprung up, beckoning passers-by with the tempting aromas of the Middle East. Owner and operator Adnan El Hamoui has taken great care in preparing a menu filled with authentic delights, from the batinjan makdus appetizer to the namura dessert. 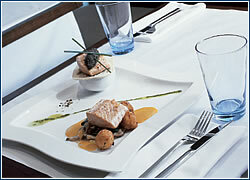 There’s also several fresh seafood dishes to choose from. What’s more, Byblos offers these treats at prices that will make the city’s other Lebanese establishments appear smug in their exclusivity. My new favorite hangout in Prague is Cihelna – right next to the river on Malá Strana. 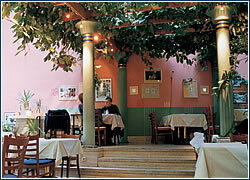 It has the high class food of Kampa Park (and the same owner) and the relaxed atmosphere of Barock. The best thing is that you can enjoy a quiet dinner in the restaurant downstairs with the view of the Charles Bridge and the river – the menu offers many exciting ethnic specialities and wines. On the other hand, if you are fond of people, you go upstairs after dinner and enjoy the bar area; shoot some pool or play some other game. This combination is what I like best.